The National U.S.-Arab Chamber of Commerce (NUSACC), in conjunction with the U.S.-Qatar Business Council, the U.S.-UAE Business Council, Meridian International Center, and the U.S. Commercial Service, today hosted an exclusive business roundtable discussion with a visiting delegation from the Gulf Cooperation Council (GCC). The group’s multi-continent tour is providing a forum for public and private institutions to share best practices in infrastructure design and implementation, as well as oversight and management that will provide guidance for the delegates’ plan for new rail works in the region. The delegation, composed of public sector representatives from Qatar, the United Arab Emirates, and Kuwait, is examining successful multi-modal railway projects in preparation for developing a world-class rail system to address the region’s growing demand. Dr. Ramiz Al-Assar, the World Bank Senior Advisor to H.E. Abdullatif bin Rashid Al-Zayani, the new Secretary General of the Gulf Cooperation Council, spoke on behalf of the delegation about the transnational multi-billion dollar project. 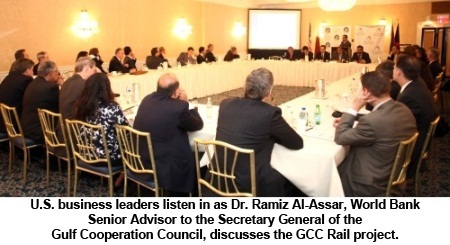 Addressing a “standing room only” crowd of over 50 U.S. corporate leaders in the transportation and rail sectors, Dr. Al-Assar assured businesses that the project is “feasible at the economic level and from the financial perspective." The proposed line, with an estimated length of 2,200 kilometers (1,367 miles), is expected to link the GCC member states. It will start in the State of Kuwait, pass through the Kingdom of Saudi Arabia, the Kingdom of Bahrain, the United Arab Emirates, the State of Qatar, and end in the Sultanate of Oman, with a potential expansion to the border of the Republic of Yemen. According to Dr. Al-Assar, the main principle behind the project is to "move [away] from carrying goods by trucks and to secure an integral part of the trans-shipment between Europe and Asia through the Gulf countries." With an official beginning date in 2014, construction is expected to be completed sometime in 2017 or 2018. The estimated capital investment for the initial construction of the railway infrastructure is about $15.5 billion using diesel trains and train speeds up to 200 km/hr (around 125 mph) for passenger transport and about $25.6 billion using electric trains and speeds up to 350 km/hr (almost 220 mph) for passenger transport. 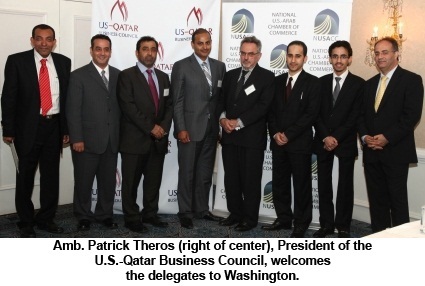 ​The roundtable discussion was sponsored by AECOM and Parsons Brinckerhoff International, two of America’s largest and best known construction/engineering firms, as well as the U.S.-UAE Business Council and Theros & Theros, a political and business consulting firm based in Washington, DC. AECOM and Parsons Brinckerhoff International have each secured large contracts in the GCC recently. At the Business & Investment in Qatar Forum in New York last April , AECOM was awarded a joint construction management contract for the new Lusail Light Rail Transit (LRT) system, a key project for the transportation infrastructure of Lusail City, one of the largest and most ambitious real estate development projects in the Middle East. Parsons Brinckerhoff recently served as the owner's engineer for the Ras Laffan C Power Plant, the largest power and water plant in Qatar, owned by the Ras Girtas Power Company. Despite such successes, concern was expressed during the roundtable discussion about the lack of a level playing field in global markets and the reluctance of some U.S. companies to enter the fray. Such concern is consistent with a view expressed in NUSACC's Trade Outlook: 2013. That publication notes, "For U.S. companies to hold their own against newfound competition from these growing Asian powers, we need to capitalize on America's commitment to high quality, open our nation's doors wider to trade and investment opportunities, overhaul America's cumbersome and sometimes humiliating visa processes, and engage the U.S. Government at the highest levels to serve unabashedly as an advocate for U.S. business in overseas markets."